[Thanks to Horticulture Chair, Kevin Tepas, for this informative report!] Boxwood is a popular hedge material because it is an evergreen with a dense growth habit. Hedges of boxwood (e.g. Boxus microphylla japonica ‘Green Beauty’) can provide walls around a lawn and divide the yard into different garden “rooms”. When other plants die back in the winter, the boxwood hedges remain green. Healthy leaves of boxwood remain on the plant for two to three years. The leaves that were cut during trimming in the spring of last year often remain green and intact long after pruning. Regular trimming helps to maintain the shape of the hedge and it also promotes more branching. However, as the new growths spread out, the older leaves get covered and deprived of sunlight. Leaves that do not get enough sunlight become photosynthetically inactive and dependent, creating an increased deficit on food supply for the ever-increasing foliage. Eventually, the dependent leaves get less and less food ration until the plant decides that they are no longer useful. Plants generally have a very accurate accounting process in this regard. When a leaf if considered unproductive, the plant will separate it by blocking the passage way for food supply until the leaf is completely dead and detached. Technically, this process is called abscission. 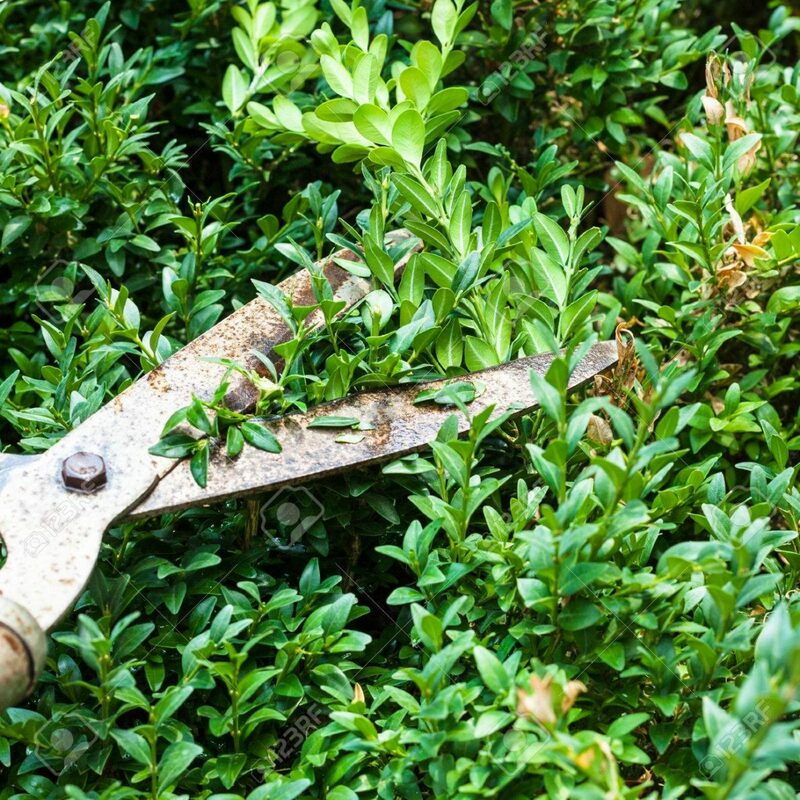 To maintain a healthy boxwood shrub or hedge, the ratio of the active to inactive leaves need to be increased. As a general rule, all leaves need to get exposed to sunlight. This can be achieved by thinning the branches to allow sunlight to reach into the depths of the canopy. Thinning also improves air circulation within the hedge thus preventing the growth of diseases. Cut off branches from within. From the dense sides of the hedge, cut into the canopy, six to eight inches long – one branch at a time. Repeat the process throughout until the desired density is achieved. Make way for light and air within. The process creates open spaces or holes for sunlight and air to penetrate the interior canopy of the plant. With time, new branches will grow from the inner canopy making the plants healthier and less likely to be infected by fungal diseases. Change canopy density. While thinning, keep in mind to maintain the shape of the plant. Thinning is not intended to change the size or shape of the plant. Instead, it is the removal of excess branches from a crowded canopy. Thin prior to the next growth spurt. Boxwood can be trimmed at almost anytime (except better to avoid late fall) Boxwoods put on new growth in the spring and fall. When the need for thinning arises, it is best to do it before the next growth spurt. It is easier to spot overlapping branches before the older branches get overgrown by the new ones. Watch the shape. Although many prefer them in their natural shape, Boxwoods do lend themselves to topiary. If you do want to impose a shape on your Boxwood remember the plant’s need for sunlight and air. The bottom parts of the plant should always be wider than the top.